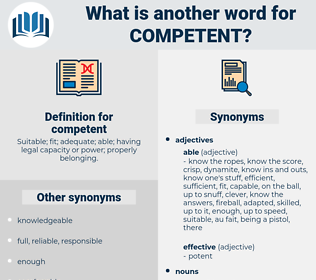 What is another word for competent? 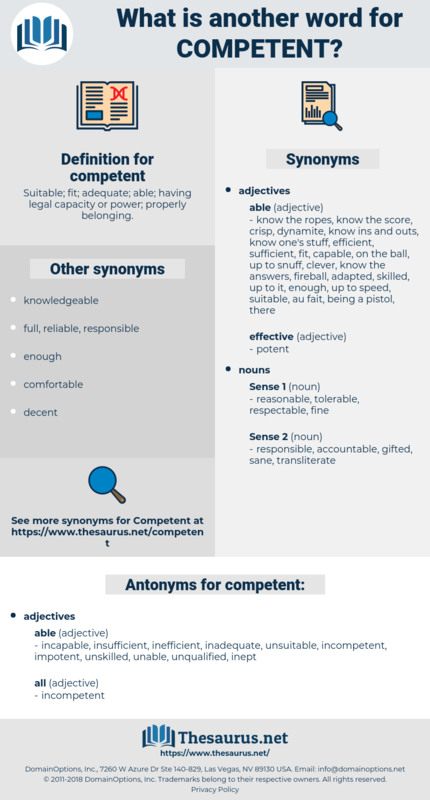 Suitable; fit; adequate; able; having legal capacity or power; properly belonging. proper, corresponding, authorised, specialised, correct, meritorious, valid, ably, satisfactory, clever, sufficient. proficient, knowledgeable, well-qualified, empowered, talented, competitive, able, authoritative, trained, well-informed, well-trained, respective, professional, skilful, appropriate, skilled, excellent, competence, applicable, accountable, qualified, adequate, legitimate, responsible. appropriate, skilled, competence, qualified, responsible. incapable, insufficient, inefficient, inadequate, unsuitable, incompetent, impotent, unskilled, unable, unqualified, inept. despotic, improper, unseasoned, arbitrary, feckless, unschooled, inapposite, new, unjustified, inapplicable, undue, unwarranted, biased, useless, inferior, unequal, irrelevant, unprepared, indefensible, untested, unfair, worthless, unmerited, unjustifiable, undeserved, untrained, incoherent, unreasonable, unjust, green, raw, illegitimate, partial, untried, inappropriate, disqualified, unsatisfactory, unlawful, Irrelative, beginning, poor, incorrect, inequitable. This was the lack of competent military officers, men with sufficient vision to co - operate effectively with the universities. You have had enough experience with both types to be competent to distinguish the one from the other.